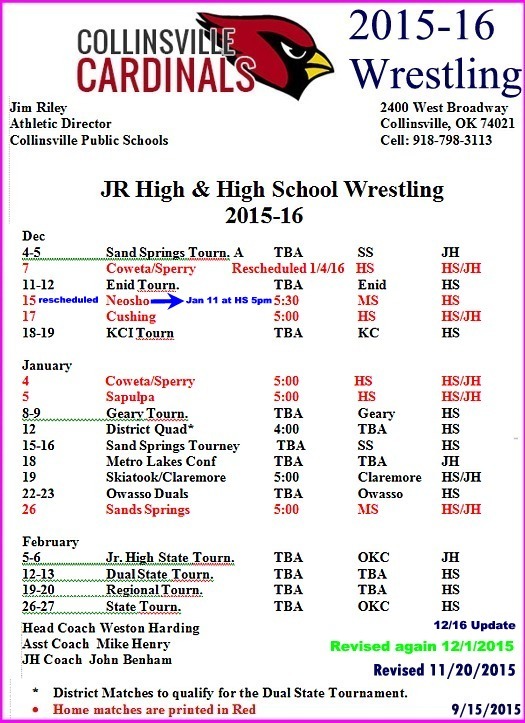 On Dec 17th we will wrestle the match in the HS main gym. Play the 7-9 Basketball Boys at the CUE and 7-9 Girls in Practice gym. 2015-16 Collinsville Junior High Wrestling Team -- (L-R) Front Row: Brandon Duncan, Drake Acklin, and Garrett Strickland. Middle Row: Riley Seawright, Gabe Lyon, Jarred Campbell, Eli Benham, and Sabe Gibson. Back Row: Kale Spradlin, Riley Hedges, Kawari Winslow, Braden Gilkey, Hunter Harlan, Cody Francis, Zach Morris, Kaden Jones, Brandon Griffin, Skyler Young, Caleb Cook and Hayden Knight.